Ruiner review: "An adrenaline surge akin to a cyberpunk Hotline Miami"
When you're in the zone, blasting waves of enemies with futuristic firearms or bludgeoning bosses with your trusty metal pipe, Ruiner is a rush of pulse-quickening violence. But there's more to this cyberpunk chronicle than its nimble, hard-hitting combat. There's distinct artistry to the quieter moments of this beat-'em-down, shoot-'em-up brawler: treks down grimy back alleys as you eavesdrop on the forlorn denizens of a 2091 metropolis, or deep-dives into your database for some surprisingly fascinating item descriptions and enemy backstories. These tidbits are a testament to Ruiner's stellar world-building and sense of atmosphere - and though this heady mix of immersion and intensity is over all too quickly, it's a blast while it lasts. At a glance, Ruiner's unnamed lead seems to be a classic cyberpunk archetype: a bruiser sporting a biker jacket, fighting for a noble cause after a mysterious hacker known as Her frees your wired brain from mind-controlled servitude. The corrupt HEAVEN corporation has abducted your brother, and the only way to find him is by busting some heads in the darker corners of the bustling Rengkok South. But our mute anti-hero and his tale of rescue and revenge aren't bog-standard tropes. Ruiner plays with the idea of the puppet-like protagonist who has almost no agency in the world when he's not administering brutal bashings. Your face is forever obscured by a high-tech mask, which constantly cycles through snippets of evocative text and imagery. And though you can choose from such emotive responses like 'Nod', 'Shrug', or 'Crack knuckles' (all with cheeky corresponding mask displays), nothing you do outside of combat seems to make much difference. Binary dialogue options with seemingly identical outcomes, a currency called Karma that has nothing to do with spiritual kismet - all building up an illusion of morality in a harsh world without choice. It's refreshing to play a cyberpunk game that revolves around a thuggish lowlife - who's patronizingly referred to as "Puppy" by Her - rather than some souped-up supercop, as is so common in the genre. Fortunately, Ruiner gives you everything you need to speak through some aggressively savage actions. Each level is a sequence of close-quarters slug outs, as armed guards or deranged gang members descended upon you in droves. You'll have to pummel and perforate them all if you want to proceed, using a mix of melee attacks, twin-stick shooting, and a plethora of snazzy-looking dashes to dart around incoming fire. The desire to keep a combo streak of kills going ensures that the combat pushes on at a perpetually frenetic pace, and you're incentivized to keep snapping up the weapons of your freshly fallen enemies to trigger a helpful flash of heightened reflexes. Everything's backed by thumping techno beats, keeping you in tribal-like trance of nonstop offense until you're the only thing left standing. It's an adrenaline surge akin to a cyberpunk Hotline Miami - but in Ruiner, you can take a few good hits before croaking, and health pickups are plentiful. Sudden death resulting in blink-of-an-eye failure still happens, but it's not a constant. Soon enough, you'll be levelling up at a steady clip and unlocking a suite of cybernetic abilities, which create some devastating combos. I'm partial to dropping a stunning Shock Launcher grenade, then triggering a Ghost Break in the confusion, forcing an enemy to fight by my side. Better yet, you can refund and reallocate your skill points at any time - even in the heat of combat - so you can experiment and tinker with your playstyle to your heart's content. In fact, mixing up your go-to setup is practically a requirement whenever you're going up against one of the many bosses. These encounters force you think smarter about how to counter incoming attacks, because trying to fight on autopilot or fall back on your favorite abilities will likely get you killed (repeatedly). Figuring out the right mix of abilities (and their upgrades) can feel a bit like trial and error, but there's a sweet satisfaction when it all clicks and you concoct the optimal loadout to take your target down. There are a few small hitches to the flow of combat, though nothing that derails the thrillride. 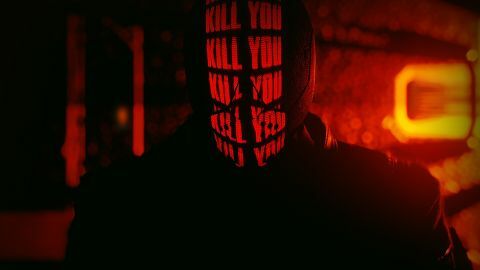 Ruiner encourages you to make ample use of the dash ability, letting you slow time to a crawl and plot out a sequence of multiple dashes in quick succession. But it doesn't match the strategic nuance of fellow cyberpunk game Transistor, as you're constantly wishing you could hard pause rather than merely decelerate combat, or zoom out to get a better sense of where you're dashing to and who you'll shoot/slice up when you get there. A few abilities are far more powerful than others; for instance, a few upgrades into the Kinetic Barrier and you'll be kiting enemies indefinitely thanks to a blockade of movement-slowing, bullet-deflecting shields. You can find powerful and wildly varied armaments stashed around in crates (or spit out by the nifty Weapon Grinders that airdrop in after lengthy battles), but you never really get the time to be attached to any one weapon before it runs out of ammo or you pick up something else out of necessity. Given that the main stages are all set in subterranean facilities, things can start to look a bit samey, as you blitz your way through labyrinths of rusty pipes and ominous machinery. Fortunately, great use of lighting helps give certain areas a distinct mood - an effect that really shines when you're topside in the hub area of Rengkok South. Everything about the city's presentation is gorgeous, in a dystopian kind of way. The dingy streets are dotted with pockets of colorful neon signs and occasionally lit up by a chopper's searchlight; the lilt of a soothing Japanese song plays ambiently in the background as passersby spout quips in Korean; the city's most important NPCs are rendered with fetching hand-drawn art that perfectly complements the 3D world. The chunk of Rengkok you can explore may be relatively small, but it packs so much character and style into every facet. You could say the same about Ruiner as a whole. My completionist playthrough on Normal difficulty clocked in at about five hours, leaving me hungry for more - but I enjoyed every minute of the experience, and plan to revisit Rengkok just to bask in its atmospheric sights and sounds. I'd liken Ruiner to picking up the first volume of a stellar graphic novel: the action is intense, the art is beautiful, and the $20/£15 price is right, even if the story wraps just as things start to get really interesting. For anyone with an affinity for cyberpunk worlds and a willingness to take on a twitch challenge, playing Ruiner should be a no-brainer - no mind-hack necessary. This game was reviewed on PC using an Xbox gamepad.